On this date in history, July 18, Edward I kicked the Jews out of England back in 1290. I wish it were more surprising than it is. England really was then, as it long had been and long remained, a land of liberty under law. Its citizens were more free, and free because of sound legal procedures, than virtually anywhere else. But anti-Semitism really was then, as it long had been and long remained, a peculiarly virulent form of hatred and could infect even a healthy body politic. Simon de Montfort, a genuine hero for his role in helping establish Parliament as an effective check on royal authority, also used anti-Semitism as a political tool. That he did so out of conviction not expedience doesn’t make it better. There weren’t many Jews in England. But those that were, were subjected to popular hatred and legal disabilities that compounded the problem by making them targets of resentment for, among other things, being money-lenders because most legal professions were closed to them. Magna Carta even has special provisions about people who die owing Jews money because under English law Jews had such restricted rights that they could not own land. So if you pledged land in return for a loan and then died, your land went whooshing right past the Jewish lender into… you guessed it… the stained yellow claws of bad King John. Jews were also forbidden by law to own many of the weapons that everyone else was not merely permitted but in some cases required to own. Which exposed them to periodic massacres including the entire Jewish community of York in 1190. And a century later they got the royal boot en masse. 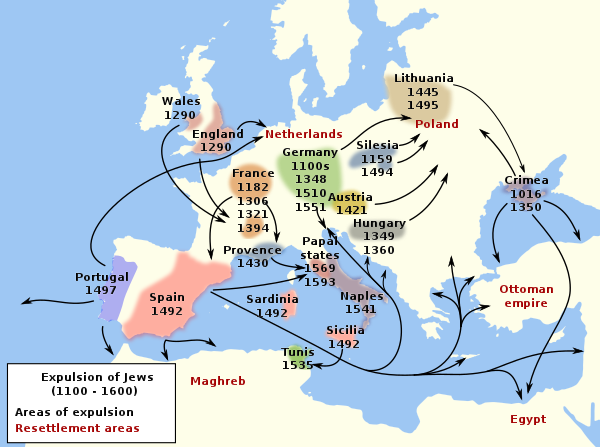 The Jews were also expelled from France… repeatedly. And famously from Spain, in the same year that Columbus set sail. And they were essentially excluded from England until under Oliver Cromwell it was decided, in a classic pragmatic English finding, that there was no actual prohibition on their presence, that Edward I had merely exercised the royal prerogative to expel a set of specific individuals now long dead. It is noteworthy that the Jews were readmitted because a leading Amsterdam Jew named Menasseh Ben Israel, fearing persecution on the continent, applied for permission and received it. Although “polite” anti-Semitism remained a feature of British life into modern times, and seems to be reviving horribly on the left, England and then the United States were havens of safety and tolerance relatively speaking. It is not coincidence that they are also societies that flourished especially by contrast with those from Spain to Russia, to say nothing of most of the Middle East, that doubled down on anti-Semitism. It is a disease that can affect even a healthy body politic. But the more virulent it becomes, the weaker the host initially, the more debilitating it becomes. Nothing can excuse Edward’s expulsion on, of all days, Tisha B’Av, which already commemorated many calamities in Jewish history. But fortunately it was much more of an aberration in England than elsewhere.